The mural designed by Carol Cure was completed today. 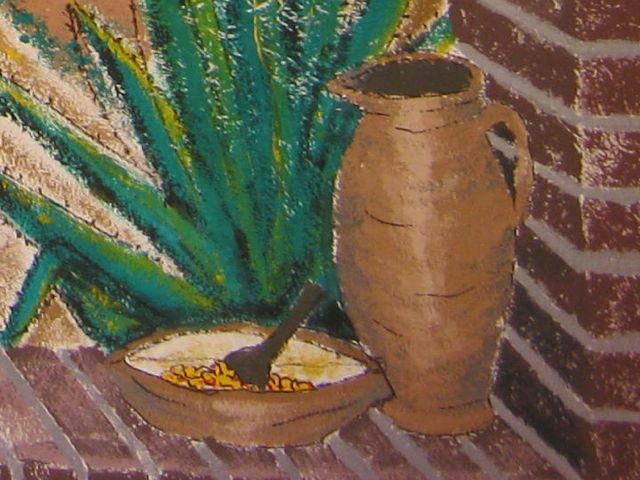 Carol did the sketching and a lot of the painting, but every member of the mission group from Oregon did at least some painting on it at one time or another. It was done in the dining room of the center for child development, which has no east- or west-facing windows. There are no scenic views from this room because both north- and south-facing windows open to other buildings. 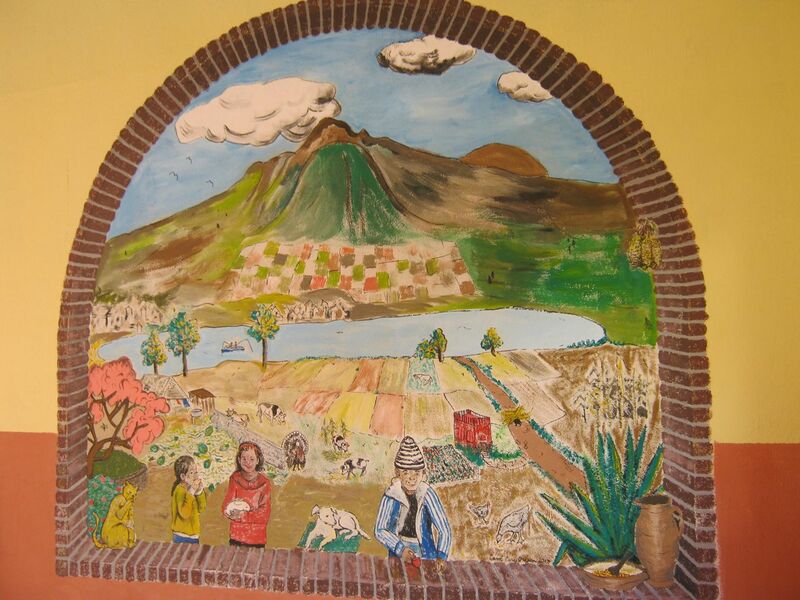 The mural depicts a window on the east-facing wall through which one can see familiar activities of Cachimuel. 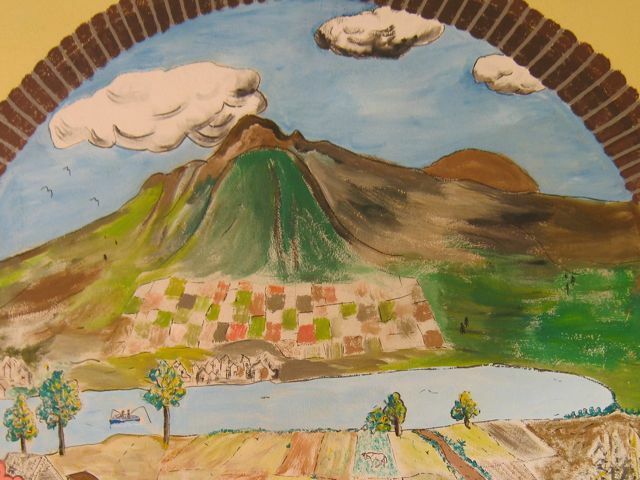 The scene is dominated by Imbabura Volcano across San Pablo lake, as it is in real life. Carol had taken many photos in and around the community and used these to insert elements of everyday life in Cachimuel - things with which the children are likely familiar. 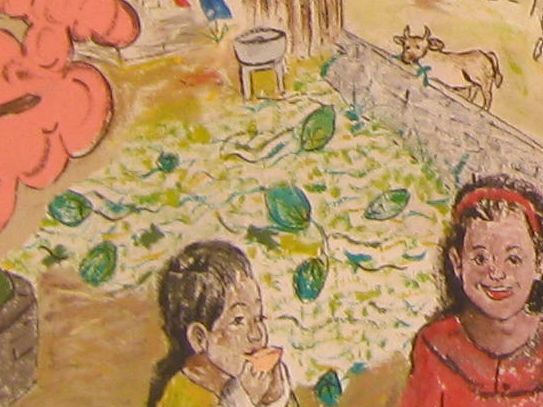 There will be other murals painted for the children in time, mostly by artists hired by the school district. For now, the children will have something on which to focus besides newly painted but blank walls, and nice floor tile where once there had only been concrete floors. Below is the completed mural. 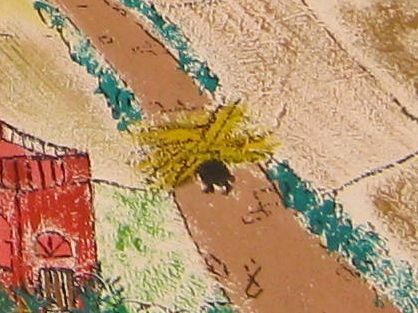 It is followed by close-ups of elements within the composition. Enjoy. For more information about Oregon's Disciples of Christ mission trip, please see Doug Collins' blog. 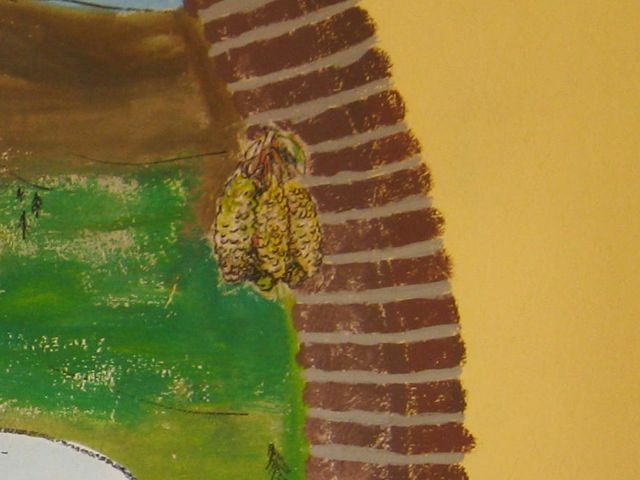 In el campo (the countryside), one often sees rows of drying corn kernels under the eaves of houses. These provide the seeds for the next crop. Fields and pastures provide colorful skirts for the mountains in Ecuador. They climb mountains until limited by cold weather or soil conditions. I have seen crops growing on slopes that had to be at greater-than-45-degree angles. When we came here on vacation in 2004, our guide joked that a cow's legs were shorter on one side than the other to compensate for the slopes. Marilyn almost bought it. 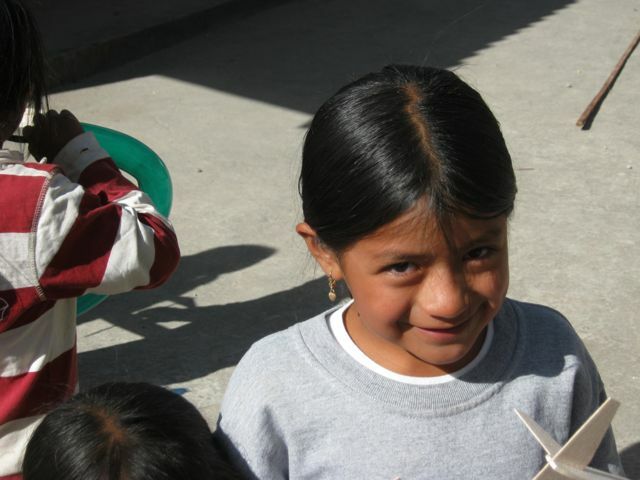 Carol said she took a picture of this little girl in the Saturday Otavalo Animal Market. 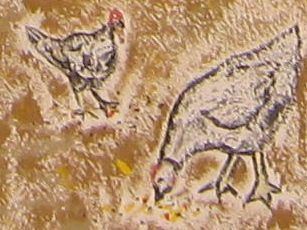 She had a sad expression, and Carol conjectured that her parents were making her sell "her" animals. 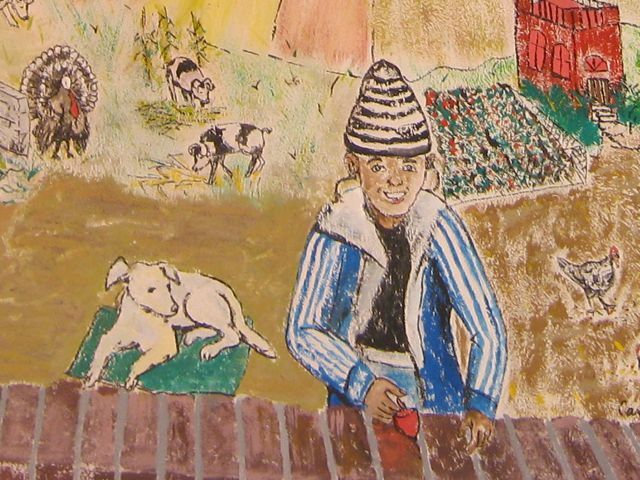 For the mural, she was placed back in the country and is happy. 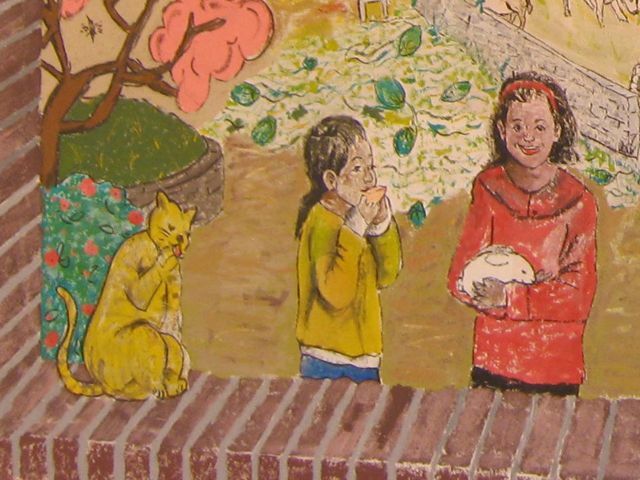 She's holding a rabbit and her cat is on the windowsill. The boy's picture was also snapped in an Otavalo market. He was contentedly eating an orange. There are fields and pastures almost everywhere one looks in the mountains of Ecuador. They provide a scenic landscape. The population continues to increase, however. 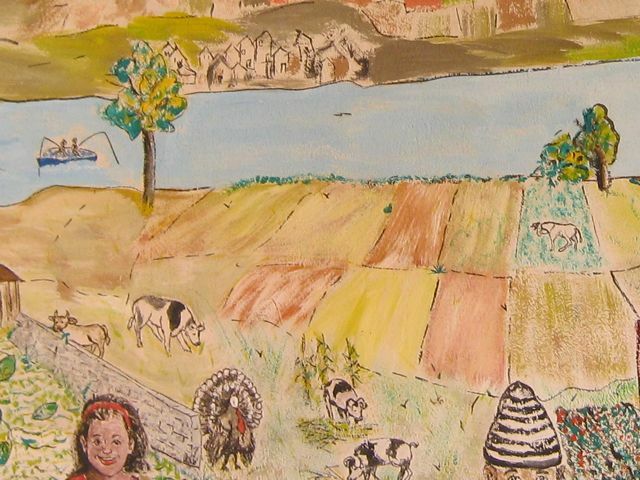 This necessitates a need for even more fields and pastures and less and less forests. True, most forests in this area are Eucalyptus, which are not native to Ecuador and are an invasive species, but they're still forests. The forests are cut for building materials, too. Marilyn and I expect that Ecuador will have more trouble with rock and mud slides in the future. This turkey is interesting. Until two weeks ago, I would have sworn that the artist was taking a really liberal license. I had not seen a live turkey in Ecuador until I went with the Pilgrim United Church of Christ mission group, who also worked on the child development center at Cachimuel. Several of the boys who hung out at the construction site often whiled away the boring times by spinning tops and doing tricks with them. David, I remember how well you spun tops when we were kids. These guys could definitely give you a run for your money. These are not too common anymore, but there are still some around to add to the beauty of this amazing country. This IS a common sight. Marilyn and I see it quite often. Unfortunately, we never seem to have our camera available when we do see it. Elderly people in the country side, usually women, will have other people bundle as many dried corn stalks to their backs as possible and tie them there. They then carry them home to use as fodder for their animals. Sometimes the load is literally as wide as an ample single lane road. I'm always saddened by this sight and don't know if I'll ever get used to it. However, as Steve Knox said in a recent post on Doug Collins' blog, it also speaks to determination and dignity of work. Thank you for this mural, Carol, and the Oregon mission trip group. I know the kids will enjoy it. However, I thank you because it provided me with a great vehicle with which to tell more about the indigenous cultures in Ecuador. Hi Glenn! I'm very much enjoying your posts of Ecuador, both because they help me get a feel for the setting of my current work-in-progress, and because they're just plain fun--kind of a vicarious vacation. Hope to get down there sometime, but in the meanwhile, I'll just treat myself to your posts. I love this mural. Thanks for explaining all the parts. Thanks, Glenn, for documenting the mural so well! It was fun creating it, and you really captured what I was trying to accomplish by it. I hope the children might look at their community a little differently now--there's beauty all around them. Thursday afternoon was the last day of working directly with the children for the mission group composed of members of various Christian Church (Disciples of Christ) congregations in Oregon. From Monday to Wednesday afternoon, they had held a Vacation Bible School at Cristo Rey de Nazareth Evangelical Church in Cachimuel. On Thursday, the children were treated to a special surprise at the child development center, on which the group had been diligently working to finish remodeling during the week. 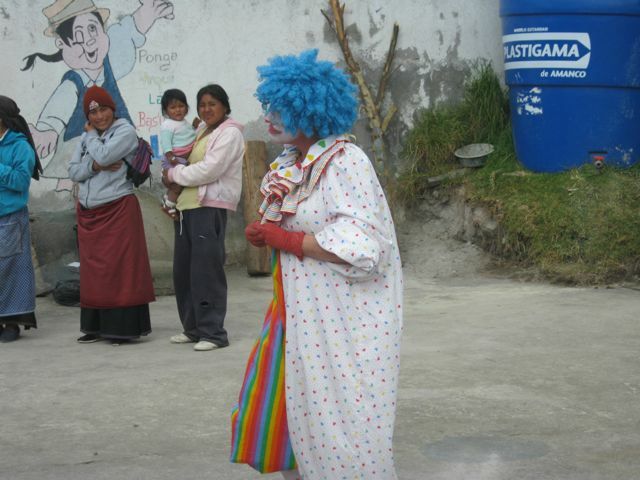 The special surprise turned out to be Corazón the Clown. Corazón was running just a tad late, so the children had to be occupied in some manner. Marilyn decided to lead them in singing, but couldn't remember the songs we had been singing all week. Unfortunately for her, her brain has glitches like that. She dredged a song from the back of her mind. It was amazing how well-behaved the children were. They sat where they had been asked to sit and really belted out the song. 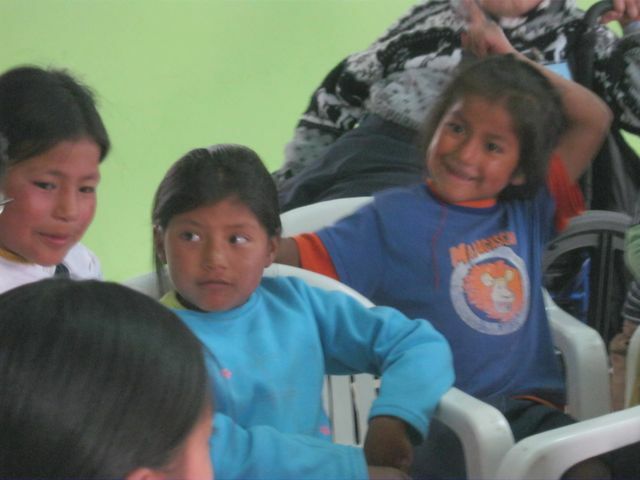 When Corazón did make her appearance, the children at first seemed awed by her. She was even more strange than I was in my wheelchair. Corazón didn't speak. She used motions and gestures to get her points across. 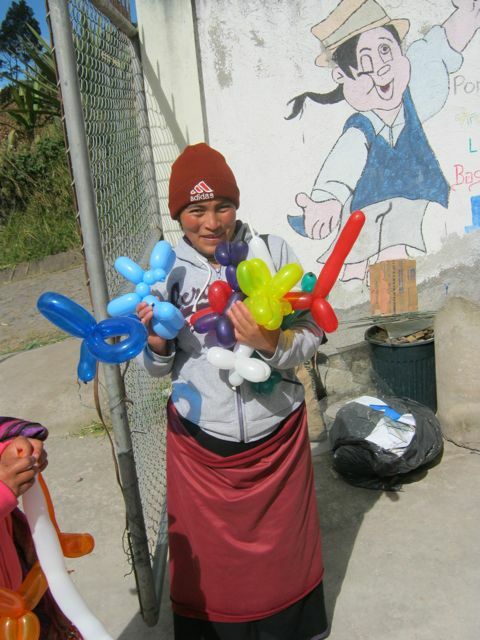 The children quickly became enamored of her as she passed out stickers in the shape of hearts (Corazones), balloons in various animal shapes (which she attempted, failed at miserably, and finally succeeded in making), and bubble blowers. After all of this, of course, the children were no longer in their seats. They ran, jumped, laughed, popped balloons, and blew bubbles throughout the courtyard. The activity only increased. Duane Hesketh brought out some Jetfire balsa wood gliders, the kind I was always fascinated by as a kid. 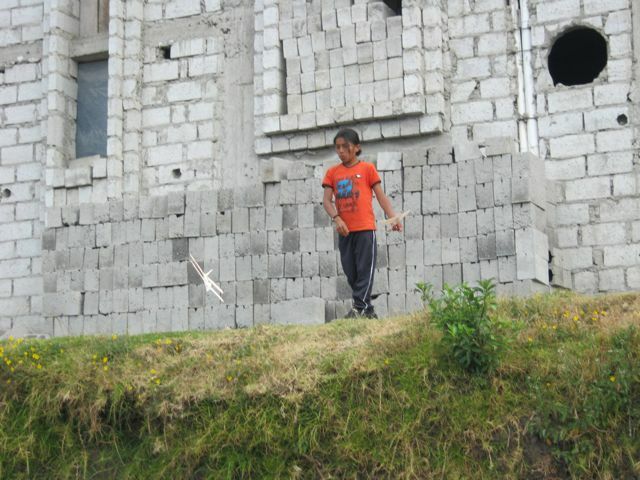 He demonstrated how to assemble and fly them before one was given to each child. In no time at all, there were dozens of Jetfires buzzing the courtyard, flying between those anti-aircraft bursts of bubbles. Corazón wasn't to be outdone, however. She had one last trick up her sleeve. She offered to take a picture of a child. When he agreed, the camera spit a stream of water into his face! Emboldened by this, Corazón ran around chasing and tricking all kinds of children. More bedlam. At least she was kind enough not to play her trick on the two-year-old who had cried during her initial appearance. I guess Corazón has a heart, not just a name that means heart. Remember that Corazón passed out heart-shaped stickers? She gave me one, too. I was touched when three of the children I'd made friends with during the week followed suit and gave me their heart-shaped stickers. When they were later transferred to my face, it looked like I had Love Measles. It was great that Corazón could make her appearance in the courtyard of the child development center the mission group from Oregon was working on. It gave the workers a chance to join in the fun or just to observe the joy of the children. After all, some of these children would directly benefit from their work. However, it was a shame that Christy Knox missed it all. She only showed up for the last hour of work, after the kids had left. I never did find out where she had been. This morning I had views of more than one derriere. This afternoon, I was grilled by a little girl (who I later learned was a little boy) about a range of topics. I never know what to expect in Ecuador. The derrieres mostly belonged to members of a mission group from Oregon. They represent different Christian Church (Disciples of Christ) congregations in that beautiful state. 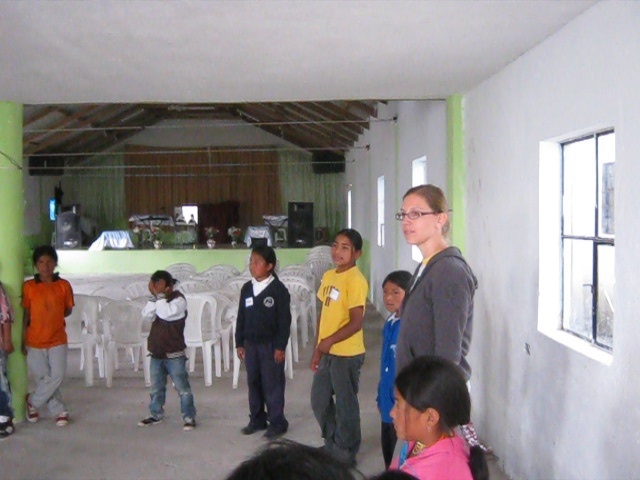 The group, though composed of different members each time, has been doing mission work with FEDICE in Ecuador over the past ten years. 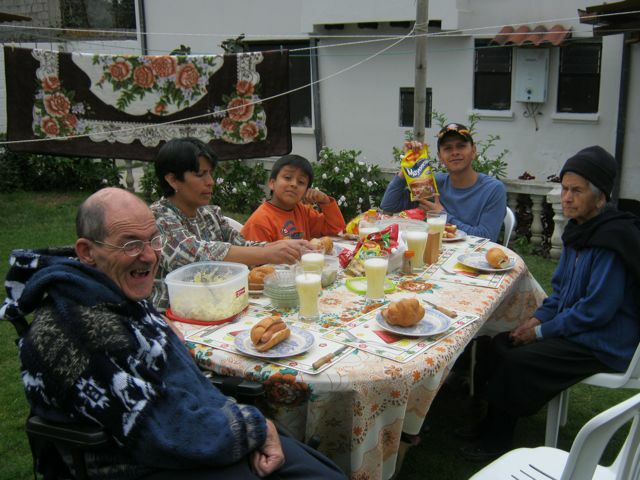 We met them in 2010, our first year in Ecuador. the people in Ecuador, identify them by nalga. 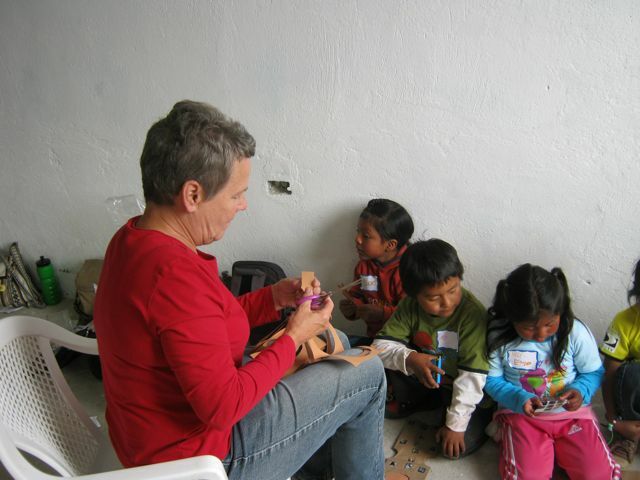 Today the Oregon mission group started work on the same centro de desarollo infantíl (center for child development) in Cachimuel that the mission group from Pilgrim UCC worked on last week. It still needed more paint, more work in the kitchen, more cleaning, and tile put down on the floors. That's where the nalgas (hineys) come in. 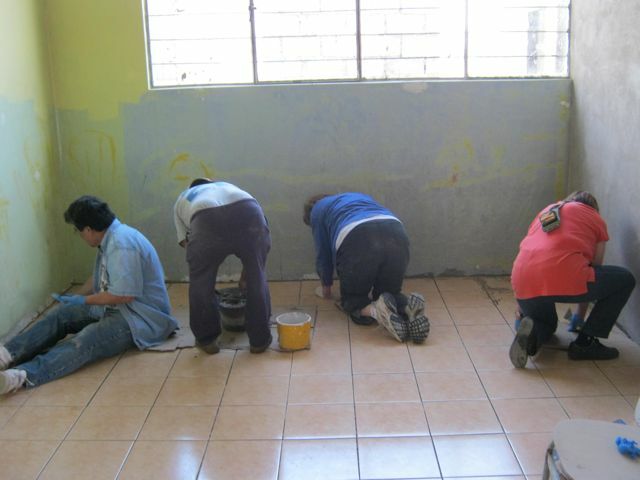 Over the weekend, community members of Cachimuel put down tile in three of five rooms. The first job of the Oregon mission group this week was to grout the tile that had been laid down over the weekend. In my "supervisory" role, I was privy to some startling revelations. The first was that there are really only three viable positions one can assume when grouting tile on a floor. One, you can sit on the floor and work on either side of your body (or between your legs). Two, you can bend at the waist and work. Three, you can get on your hands and knees and work. The second revelation that startled me was that position number three was the preferred position by far. Since people worked from the walls to the center (as they should do when grouting a tile floor), I could only talk face-to-nalga, a little disconcerting. The third revelation to me was that Oregonian nalgas are just like Texan nalgas, or Illinoian nalgas, or Hawaiian nalgas, or even Ecuadorian nalgas (yes, I saw a few of those, too.) Yesterday, Steve Knox said in his sermon that we are all one race of people belonging to God. If he had needed to prove his point, he could have shown slides of nalgas from around the world (clothed, of course.) There are many different shapes and sizes of nalgas, but one can't escape the fact that they ARE nalgas, pure and simple. Enough of nalgas, however. In the afternoon, part of the group went up the hill to Cristo Rey de Nazareth Iglesia Evangelical (Christ King of Nazareth Evangelical Church) in Cachimuel to teach a Vacation Bible School. The children were split into groups. While one group listened to the story of Noah's Ark, other groups were making puppets (of animals, of course) or coloring a Noah's Ark scene. Then the groups switched so everyone would have a chance to partake in all activities. Finally, we all gathered together and sang songs. At one point, I was sitting next to a child of about seven who turned out to be very curious. No doubt, most of the children in the rural communities we visit tend to be curious about my disability. However, this little guy didn't hesitate to ask questions. I began to think my nalga was on a grill. These are a few of the questions I understood enough to answer. "¿Usted puede hablar? (Can you talk?)" "Yo estoy hablando ahora. (I'm talking now.)" "¿Que comer? (What do you eat?)" "Todo. (Everything.)" "¿Donde esta sus piernas? (Where are your legs?)" I shook my legs. And, my favorite, "¿Usted casada? (Are you married?)" "Sí," and I pointed to Marilyn. Marilyn never stopped working with the children all afternoon. Therefore, we don't have any pictures of the children at VBS to post tonight. However, this is only Monday. There will be many more chances throughout the week to take and post pictures. What a treat, Glenn! I love your blog and the picture. I love the tiles. We worked so hard to get that floor clean for them. Thanks for the compliment, Polly. It's good to know that you are back in Durham safely. 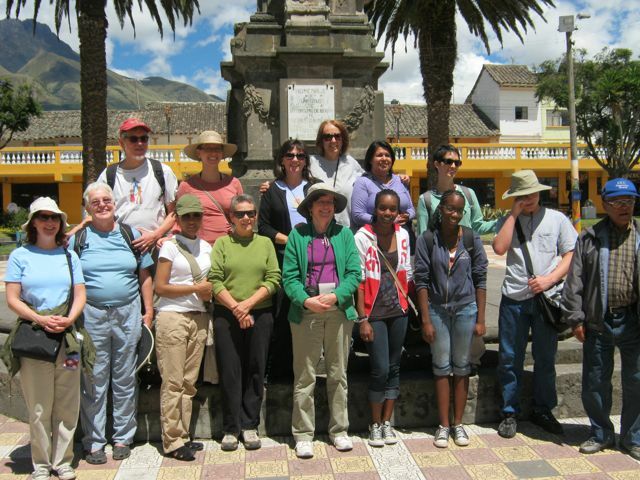 The mission group from Pilgrim United Church of Christ left Otavalo (actually, Cachimuel) at 1:00 pm today. We will meet the mission group from various Christian Church (Disciples of Christ) congregations in Oregon at approximately midnight tonight when they arrive in Otavalo. For Marilyn and me, it sort of feels like we're in the calm of the eye of a hurricane, an eye that won't pass over for eleven or twelve hours. But the hurricane is constructive rather than destructive. Pilgrim UCC represented the forward right quadrant of this hurricane, the quadrant most dangerous because of the unknown. Would the winds pile the water into unmanageable activity? Would there be so much rain we were flooded and forced from the work project? Would the storm spawn tornadoes of misdirection? Happily, none of this happened. The forward right quadrant of the hurricane was well-behaved, leaving in its wake life-giving construction on a pre-school, life-sustaining instruction in a Vacation Bible School, and life-altering bonds of friendship. Now we await the backside of the hurricane, represented by the DOC mission group from Oregon. As many know, the backside of a hurricane can be even more forceful than the front because, whereas the front side gradually increases in intensity, the backside of a hurricane shatters the calm of the eye in an instant. We've experienced the backside of the hurricane in 2010, when the Oregon mission group followed the Austin mission group. It left construction and a string of powerful relationships in its wake. We're bracing ourselves during the remaining hours of calm. As some do during the eye of a storm, we've taken advantage of the calm to re-supply ourselves and make temporary repairs. Marilyn has gone to the bank. Isabel and Marilyn have shuttered the rooms of the Ally Micuy with welcoming touches, for we welcome constructive hurricanes, frontside and backside. I have taken advantage of the relative calm to check in with the world and let people know that we're very much alive. I hear thunder. The eye of this powerful hurricane will complete its transit of Otavalo soon and we'll be thrown back into working with the unimaginable forces of good people. Sorry I couldn´t be with you last night and today. Maria took me to the hospital, where they prescribed some antibiotics, so I hope to be with you by Monday, at least, if not before. Love you, miss you, and I hope to be better soon. Marilyn was under the weather on Sunday, July 8th, so we didn't go with the Pilgrim United Church of Christ to worship in Cachimuel. Therefore, I can't write about that directly. However, from personal experience, I can imagine that their worship experience was very meaningful. Agustín, the pastor of the congregation, as well as the congregation itself, is very warm and welcoming. The "Traveling Pilgrims" rounded out their day with a last afternoon of sightseeing in our beautiful Otavalo-Cotacachi-Ibarra area by going to Cascada de Peguche and Cotacachi. Monday was the first day of work. 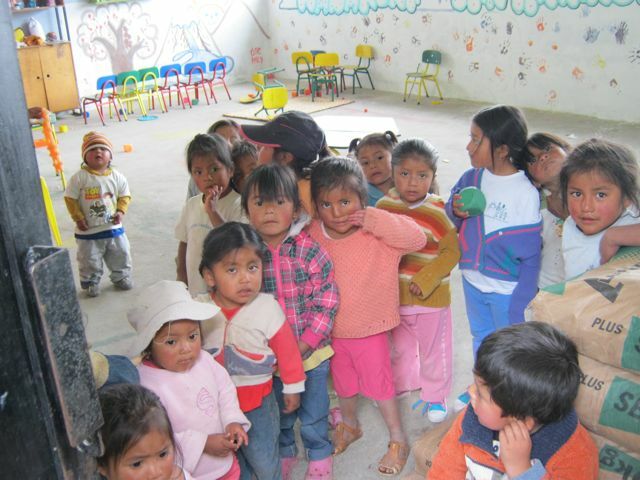 The Project: help remodel a centro de infantíl (child development center) in the community of Cachimuel. One of the buildings was originally built with a very large room. Naturally, when 20 or 30 students (all under six years old) were in the room, it was hard to teach smaller groups due to the loud echoes in the building. (In pre-schools here, there's no such thing as carpet, at least not that Marilyn and I have ever seen. The pre-schools are all made of hard surfaces - concrete, metal, glass - and sounds are very "live".) The task was to divide the large space into smaller rooms and paint. Also, the bathrooms needed some serious help. None of the doors shut, the toilets and sink all leaked; the space was rather cramped. The old had been demolished and new bathrooms were to be built. The money for this came from two primary sources: from the parroquia (self-governing "parish") in which Cachimuel is located and from FEDICE. Much of the monies contributed by FEDICE were gathered from churches like Pilgrim UCC through Global Ministries. 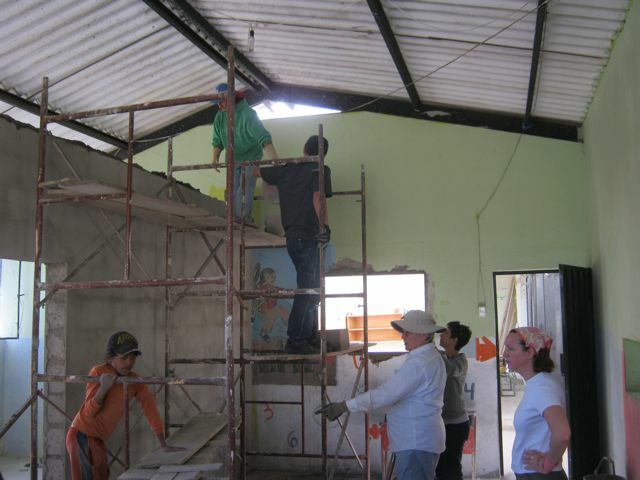 The workers were supplied from the community of Cachimuel and the members of the Pilgrim UCC mission group. First, there was a ceremony for blessing the tools. Everyone formed a circle around the tools to be used. Prayers were said to insure a successful project. The children attending the pre-school then entertained the entire work crew by singing and dancing. They were soooooooo cute. The cinder-block dividing walls had been partially erected by citizens of Cachimuel before Pilgrim UCC arrived. However, they needed to be heightened, "stuccoed", and painted. This was done throughout the day and on succeeding days. People from Pilgrim did things that they probably had never dreamed of doing before, like carrying cinder-blocks and mixing cement or mortar by hand - and enjoyed themselves in the process. In the afternoon, some of the members from Pilgrim UCC split off from the construction crew. 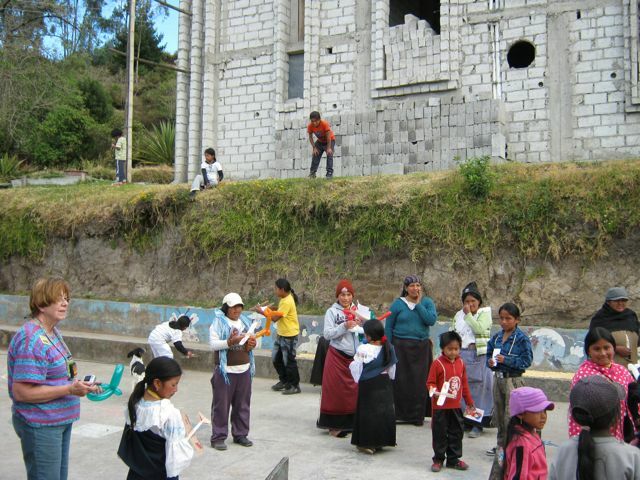 They went up the mountain, to the church they had worshipped in on Sunday, and taught a Vacation Bible School. The children ranged in age from a tiny girl who didn't even know how to use crayons to 16-year-olds. 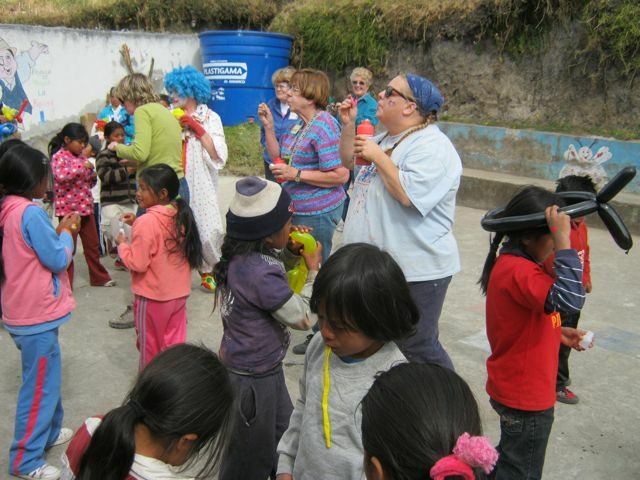 They enjoyed songs, Bible stories, games, and crafts. If you could somehow put the laughter and frolicking into church bells on Sunday morning, no one would miss church. Cristo no está muerto. ¡El está vivo! Lo siento en mis manos. Lo siento en mis pies. Lo siento en todo mi ser. Christ is not dead. He lives! I feel him in my hands. I feel him in my feet. I feel him in all of my being. Tuesday and Wednesday followed pretty much the same pattern. At the evening meals and reflections I often saw a contrast. Everyone would be dead-tired, yet everyone would have big smiles on their faces when they thought about the day - the child snuggling in a lap, forming a line to haul cinder-blocks, seeing the face of God in a fellow human being, knowing that they were loved by people from a different culture. 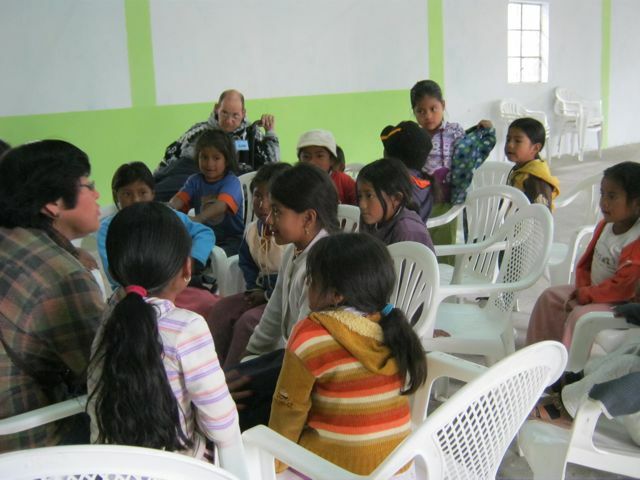 The Pilgrim UCC mission group certainly faced it's share of hardships and challenges - and it began with their arrival in Quito. The Ecuadorian officials decreed that the documents possessed by Phelecia and Sharon, two young sisters in the group, were not sufficient to allow them into the country. Thus, they spent the night under armed guard in a small room of the Quito airport before they could fly back to the U.S. That had to be traumatic for two young African girls. It also left a huge void in the mission group. Several members also experienced illnesses. But, the group kept on truckin' and it was a pleasure for all of us in FEDICE to work with them, get to know them, and know that we had become friends with them through working, sharing, caring, and playing. I'm glad you finally got to the blog and enjoyed it. It took me a while to get your email address correct, too. Instead of hotmail, I was sending it to notmail. I was really intrigued by the method the people used when they had to cut tile. They first scored it, then they gave the tile a sharp blow. The tile broke at the desired place clean as a whistle everytime. No need for electric saws! Tonight the mission group from a United Church of Christ in Durham, NC, arrived in Quito safely and on time. Marilyn and I expected to meet them at the Ally Micuy Hotel at 9:00 or 9:30 pm. However, red tape reared its ugly head. Two of the 16 group members, Sharon and Phelecia, were originally from Kenya and only had green cards to work in the United States. One was 17 and the other was 21. They were both females. While citizens of the United States, Canada, England, and probably most European countries can come here with a valid passport and automatically receive a 90-day visitor visa, Ecuador requires that people from Kenya have a visa before they come. No amount of pleading from FEDICE or the mission group's leaders could get the officials to change their minds. It didn't matter that they were legally residing in the United States. They didn't have a United States passport. It got worse. Because there were no returning flights to the U.S. until 6:30 am the following morning, Phelecia and Sharon were put into what is called an exclusion zone. This is a room with hardly more than a few chairs and guarded by armed guards. Until they got back to the U.S., Sharon and Phelecia were officially without a country. The image of an armed guard watching over a room containing two young African girls whose only crime was a desire to help people in another country is disturbing, to say the least. The group also felt badly because Sharon and Phelecia were once again the recipients of discrimination. So when the group arrived at the hotel at close to midnight, they were not only tired, but also emotionally drained and bummed out. FEDICE has never encountered this problem, though we've hosted mission groups for twelve years or more. One of the things we'll be more diligent about in the future is warning people to make sure they have the proper documentation for international travel. If either of you happen to read this, Sharon and Phelecia, please know that you will be in the hearts and prayers of your fellow group members, as well as the FEDICE team members, all week long. Your absence is deeply grieved. Breakfast was supposed to be at 8:00 am this morning, but was pushed back to 9:00 am due to the group's late arrival in Otavalo. After eating heartily and drinking a type of passion fruit juice, the group embarked on a full day of sightseeing. First on the agenda was the short walk to Otavalo's Saturday market. There, people could shop in the sprawling open air market to their heart's content, or until 11:15 am, whichever came first. One purchase I remember was made by Ginger. She bought what I've always thought of as clown pants. But she absolutely loved them! Hey, to each their own, right? Next, we met our bus and took a short 20-25 minute ride to San Antonio de Ibarra. They do wood carving there. Some of it is religious art that is really striking. Some of it is furniture. And still other pieces are carved into what I would term knick-knacks. In Ecuador towns are often identified with a particular product. This is because artisans of a given type were segregated when Spain ruled. Why? It simplified export, of course. 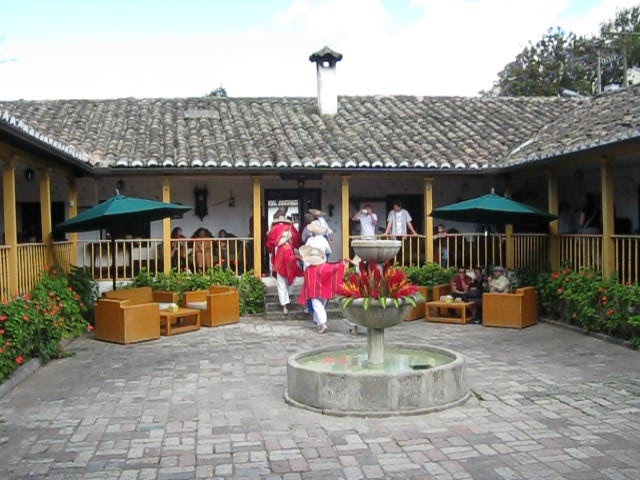 By this time, stomachs were beginning to growl, so we ate a huge lunch at the Hacienda Charlovi, a traditional Spanish-style hacienda converted to a hotel and restaurant. While we ate, a band played Ecuadorian music. That was good, but the best part was watching dancers doing traditional folk dances. Their costumes were absolutely gorgeous, and they danced with contagious joy and abandonment. The last sightseeing stop was Lake Yahuarcocha. A mighty battle was fought here between the indigenous peoples and the Incas. Thus, the name Lago Yahuarcocha, which means lake of blood. But we weren't concerned with ancient battles today. Birdwatching, peoplewatching, and a boat ride on a lake of whitecaps were the order of the day. After dinner, we had a time of reflection. Prominent during that time were Sharon and Phelecia, of course. We had heard that they were driving to their home with their mother after having spent a sad night in the Quito airport and taking a 6:30 am flight back to the U.S. We all deeply wanted them to be here and lifted them up in our prayers. Tomorrow we'll worship at Cachimuel, where the group will be working during the week. Then we'll do some more sightseeing. Today I heard someone say, "They're pulling us in with wining and dining before cracking the whip when it's time to work." Usually, people don't catch on that fast. Today FEDICE begins a very busy stretch for which we are all grateful. During the next two and a half weeks three mission groups will be visiting from the U.S. We are very blessed that they have chosen to partner with and further the humanitarian work of FEDICE. Marilyn and I will be at the Ally Micuy Hotel tonight to help welcome the first mission group. They are a group of 16 people from a United Church of Christ in North Carolina who have not worked with us before. (Global Ministries is supported by both the United Church of Christ and the Christian Church (Disciples of Christ).) They will be helping to remodel a centro para infantíl desarollo (center for child development) in the small community of Cachimuel. They will be in Ecuador July 6-13. We certainly look forward to facilitating their mission trip experience and introducing them to Ecuador, specifically the Otavalo area. The second group of 6 people is from Illinois. They have a wonderful working relationship with FEDICE and will be in Ecuador July 10-12. 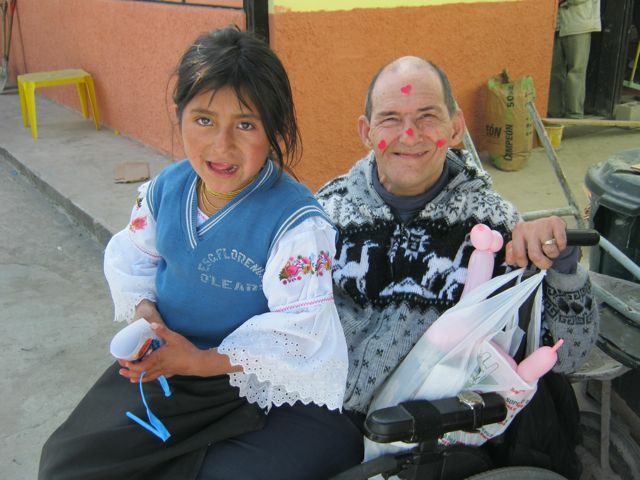 They are primarily involved with the centro para infantíl desarollo in Romerillos, Ecuador (south of Quito), which past editions of this group helped to build. 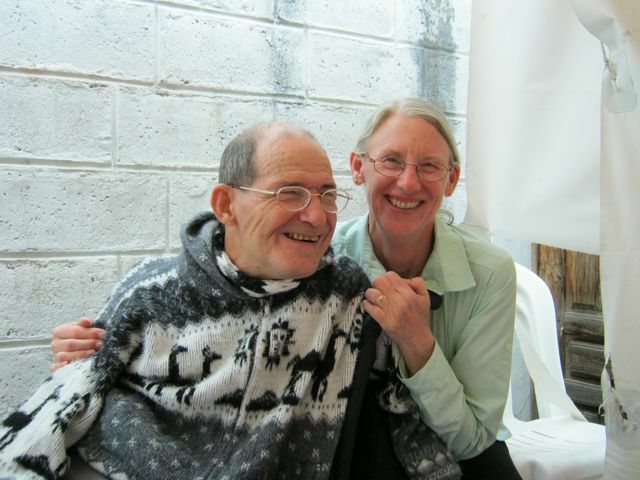 Marilyn and I won't get to see them because we'll be involved with the first and third groups in the Otavalo area. They'll be well taken care of by Blanca and Marco down south. The group from North Carolina will leave us about midday on July 12th, and we will be at the Ally Micuy Hotel at about midnight to welcome a mission group of 12 people from various Christian Church (Disciples of Christ) congregations in Oregon. This group also has an excellent, long-term working relationship with FEDICE. (In fact, this marks the tenth year of the partnership.) 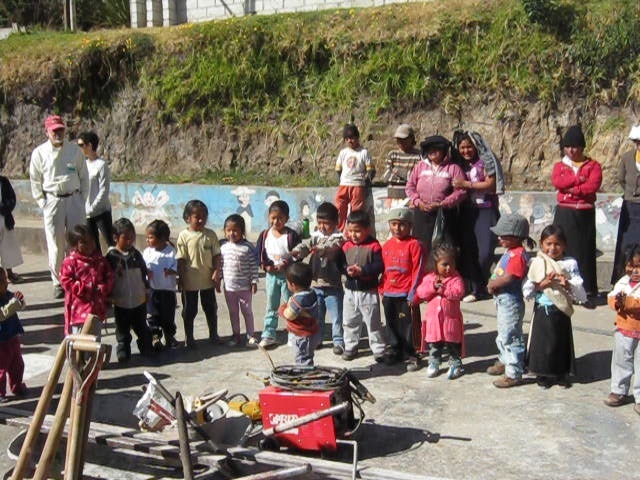 They will be continuing work on the centro para infantíl desarollo in Cachimuel. 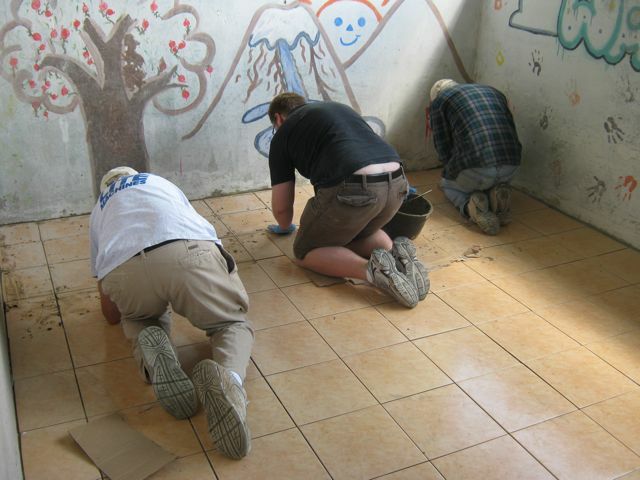 We were privileged to work with this mission group in 2010, the last time they came. We look forward to seeing five returning 2010 members and making new friends with the rest of the group. Finally, Felix Ortiz-Cotto, Global Ministries Executive for Latin America and the Caribbean, will visit July 21-24. We have worked with Felix before and look forward to seeing him again. So, today we're all catching our breaths in anticipation of working hard, praying hard, and playing hard for the next 17 or 18 days. Stay tuned, as one of my jobs will be to update this blog regularly during that time. We're excited about the blessings we're receiving! At about 1:30 pm, we had a picnic in the backyard in honor of the Fourth of July. We had hot dogs on pan de agua (sort of like baguettes or French bread), potato salad, guacamole and Tostitos, pineapple juice, and a scrumptious deep dish apple pie that Marilyn made. The kitchen table had been moved to the backyard, so we ate in comfort. Even Canela settled down after the food stopped coming out of the house. Marilyn said a nice prayer, giving thanks for our independence from England and also Ecuador's independence from Spain. Then we all dug in. I loved everything. The family also liked the traditional Fourth of July meal. The Fourth of July seems to have more meaning for us in Ecuador. That's no doubt because it's easy for us to see the differences in governments and, thus, in average living standards. With all the turmoil the U.S. goes through - from wars, to culture upheavals, to financial upheavals, to political stalemates - there's hardly a doubt that the average person's life in the U.S. is more prosperous than the average person's life in Ecuador. Some people here don't like the U.S. We can tell that from some graffiti we've seen. But many admire the U.S. 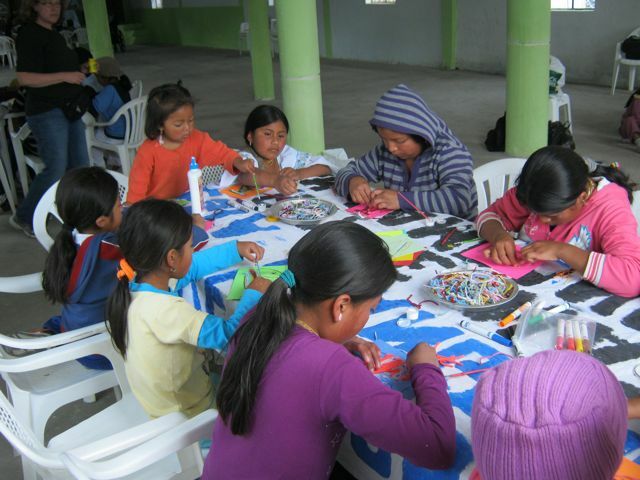 When we were here in 2008 with a mission group from United Christian Church in Austin, TX, we ran into an Ecuadorian organization called the Quatro de Julio Foundation. When we asked why it was named for the Fourth of July, we were told that it was because the U.S.'s independence on that day in 1776 signified hope for a better way of life. "I'm a yankee doodle dandy. I'm a yankee doodle guy. I've got a yankee doodle sweetheart. She's the apple of my eye! I am that yankee doodle guy!" We hope you, too, had a great Fourth. In April, we went to the regular monthly FEDICE meeting in Quito. Unfortunately, Victor was ill, so Blanca led the meeting. Maybe because she has had to learn a new language more recently and understands the difficulty of the process, she went to the trouble to translate for us when we only got the general idea of the conversation, but not the particulars. We were touched by the financial needs of FEDICE and some of the work that FEDICE had no funds to accomplish. 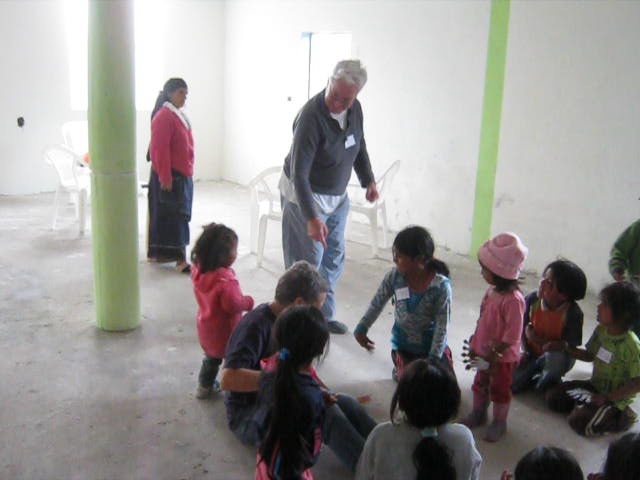 On the drive back to Otavalo, we talked about giving a gift to “programs where needed most”. We followed through the following day. 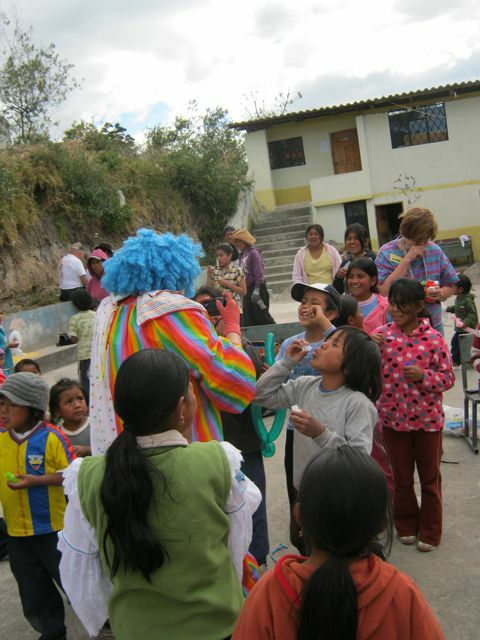 Our gift was used to continue a project in a mountain community near Latacunga (south of Quito) called El Chaupi. Thirty-six families (many headed by women), over the last 4 years, have been enabled to purchase a cow each year. 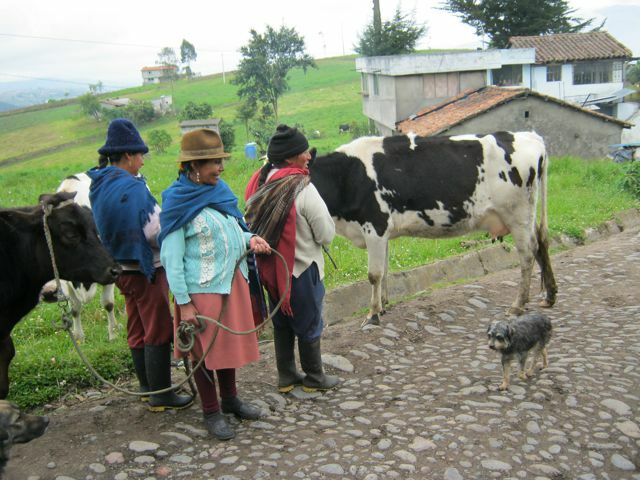 The cow produces milk twice a day that is picked up from the families by a lecheria (dairy company). They are paid $.24 a liter for the milk. FEDICE has provided instruction through Marco, an animal and agricultural specialist who works for FEDICE, on the care of the cows and on how and when to provide inoculations and vitamins. Through these small herds of ganado (cattle) the families now have enough money to send their children to colegio (high school) and universidad. We did not have the opportunity to see this community several years ago before FEDICE’s project began. But we can imagine how these poor farmers might have lived before compared to the gift of having milk to sell on a regular basis. We went with Blanca and Marco yesterday to visit El Chaupi and take pictures of the proud owners and their cows. As we drove up the mountain, we were stopped several times by small groups of people who were part of FEDICE’s project. We stopped between the pastures and fields of crops and took their pictures. This was a regular, monthly meeting and 3 month evaluation. Earlier that day, all the cows had had their inoculations. They were not interested in being touched by another stranger, but Marilyn did get to stand next to them for photos. There was a small presentation, but a large thanks given to us. We felt very appreciated, yet humbled as we did not feel we had done that much. We hope we are not like the mission trip junkies (Marilyn heard this term a few years ago - from where, she can't remember), who like to work on mission projects overseas because they are made to feel so special by the project recipients. The owners explained their project and we shared a little about ourselves. For 4 years, FEDICE has been providing 1-year loans for them to buy cows. They sell the milk that's produced each day. The income is used for both daily living and to pay off FEDICE's loans. The participants in this very successful program in some ways have remained the same during the 4 years, yet in other ways, their lives have been enhanced. Very few have left in search of work elsewhere. They have also learned to save regularly. Each family saves at least five dollars a month, with some saving as much as ten and twenty dollars. A couple of people proudly showed us their records of savings, and it was nice that 10-year-old Brayan got to see them because we've been attempting to help teach him how to handle money. Their children no longer quit going to school after they finish escuela, but go on to colegio and universidad. One individual mentioned she now had a radio. The early afternoon ended with free range chicken soup, cuye (guinea pig), avocado salad, and chicha (a non-alcoholic drink made from corn). In addition, we were presented with some fresh eggs and 3 liters of fresh milk to take home. 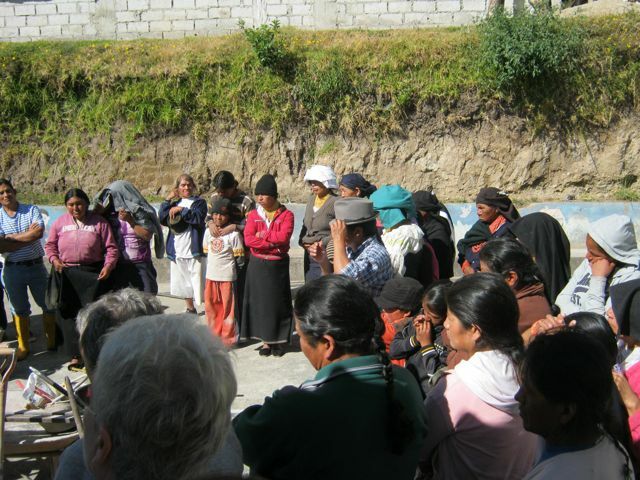 It was a long drive (9 hours getting there and returning to Otavalo) yesterday, but it was also great to meet many of the women, children, and a few men whose lives have been changed by FEDICE´s help.